In the always improving smart home appliance space, Amazon has once again proven that they know exactly how to remain top dog. 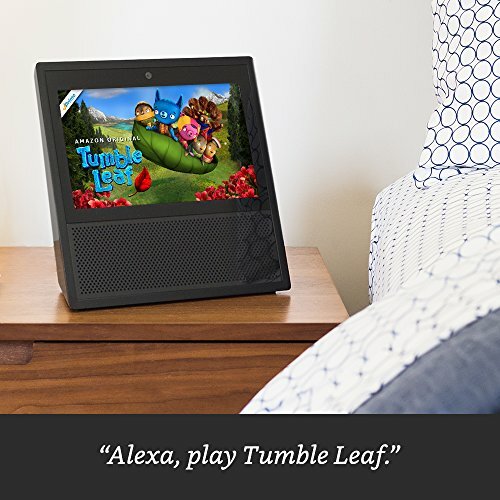 They’ve added a couple new players to their Echo product line that are just as remarkable as their predecessors in the Echo Spot and the Echo Show. They both have a similar notable feature: a screen. This visual component to the Echo family may make these Alexa products more attractive to some consumers – but also may make them seem really comparable to each other. 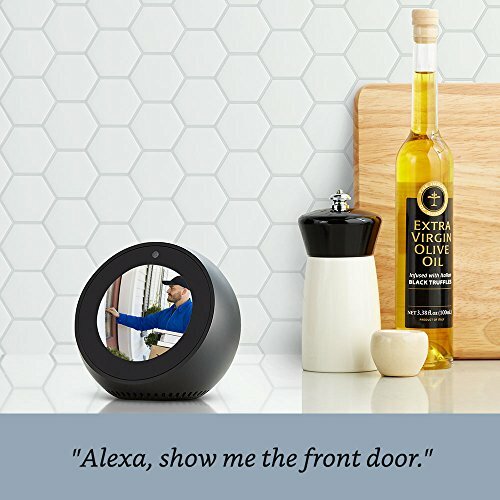 So then who wins in the battle between Echo Spot vs Echo Show 2? 2 What is similar about these two Echo Devices? 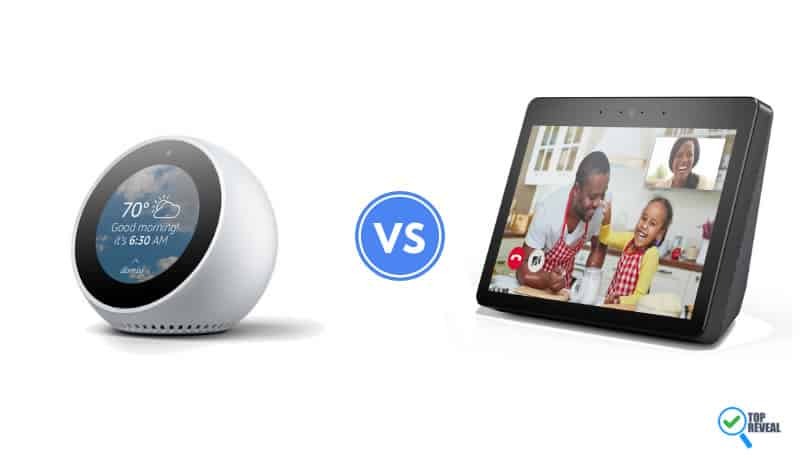 3 What is the Difference between Echo Spot versus Echo Show 2? If it was up to us, we would pick the Echo Show 2 for our home. Why? Well, we’re the kind that likes to set up a big, beefy smart home appliance and know that it’s there. The Echo Show features a large screen and is meant to be given a mostly permanent place in your home. However, the Echo Spot is handheld in size making it perfect to set on nightstands, in kitchens and walked around to different rooms. Of course, this smaller size means you give up a nice, big screen so you can’t watch TV on it. That’s why we prefer the Echo Show. Unless you’re talking about a TV, the Echo Show 2 is the largest screened 10″ Alexa enabled device there is. The screen is outstanding for seeing your shopping list, watching TV, and seeing the baby monitor. The larger screen gives the device a more modern design that mimics the new iPhone in the sense that there is practically no casing in the front, giving you more to see. If you are the kind that wants to see it instead of hear it, you’ve gotta get an Echo Show 2. Additionally, this nice, big screen makes it possible to watch TV on an Echo device and the addition of Silk and Firefox browsers will let you binge just about anything! 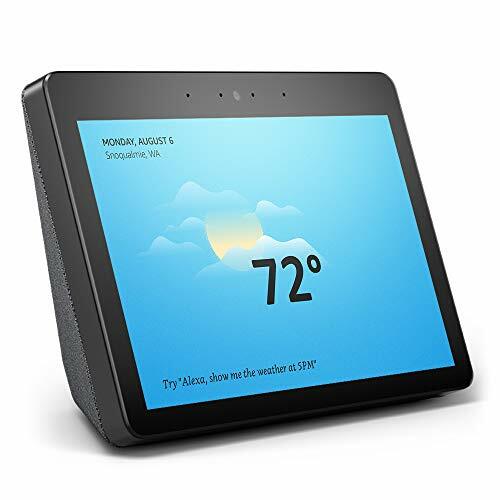 Check out $100 off Deal in Echo Show 2017 Here. As I said, the Echo Show 2 will have the Silk and Firefox browsers, but that’s not the only new additions. They’ve also partnered with Hulu (binge-time anyone? ), Skype ( more on that in a few), and Microsoft, allowing you to access Cortana. What does all this mean? It means you can watch virtually anything in the Show 2 anywhere in your house. Even if you are watching TV super loud or bumping your favorite tunes, Alexa will hear your voice commands from across the room. The mics in the Echo Show have far-field technology so they will still hear you no matter the case. This is something that you will appreciate with the kids running around screaming and you just need a companion that understands. What is truly unique about the Echo Show 2 is that it combines the big speaker with the big screen. There are other Echo products that have a nice speaker, sure. And the Echo Show 2 has a cute screen that is plenty useful. But no other Echo product can say that they have a room-filling speaker along with a screen that can be seen across the room. With the all-new Show 2, you can not only call others but see them thanks to the addition of Skype. Which means you can call your mom when you’re cooking and she can “show” you what to do (see what I did there?) or you can call your kids if you’re at work late and they need to see you. This Echo product can be picked up and carried around about as easily as a large apple considering its comparable size. This makes it simple to move around your home if you think you desire a more portable option in your new smart home. Anywhere there is an outlet on the wall, it probably makes sense to put an Echo Spot. The miniaturized screen installed on the front of this Echo product gives you a visual to go along with your audio experience. If you have an original Echo, you realize how cool it would be to be able to see the answers to your questions just as easily as hearing them. This small screen makes it easy to check on things at a glance – but may not be awesome for binge-watching Netflix. As with all other current Echo products, this one has a speaker built into it. The mics make it so all you have to do is talk to Alexa and your virtual assistant will help you out with whatever you want. And, of course, with Alexa’s always growing skill library, you can access tens of thousands of different Alexa abilities. 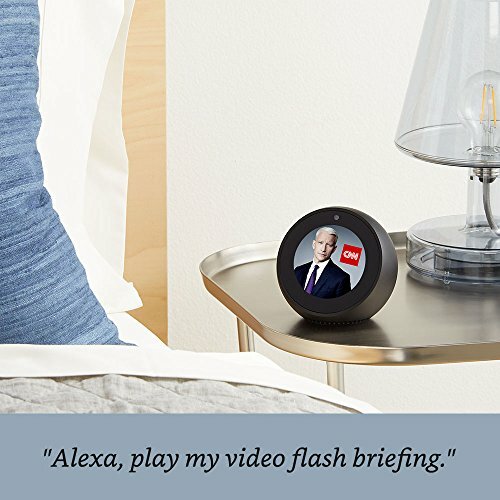 What is similar about these two Echo Devices? To start our comparison, it would help to mention what is comparable with these products. First, they both feature their prominent screens. Second, both of them are voice activated. And, third, the two of these products can both access Alexa and all of her awesome abilities. So, in those ways, these two products are quite similar – which you would be thankful for if you got either of these Echo options. What is the Difference between Echo Spot versus Echo Show 2? This is probably the most obvious difference between these two Echo competitors – but this difference should not be understated. With the Echo Show 2, you have the ability to carry your smart home appliance around pretty easily. Just unplug it, hold it in the palm of your hand, and plug it back in wherever. However, the Echo Show is larger and bit heavier, lending itself to a more stationary experience. It is probably best left in its own home in your home on a semi-permanent basis. As we just mentioned, the Echo Show 2 is simply bigger. For that reason, the speaker is also bigger and can absolutely fill up a room with high-quality sound. You’ll be able to feel the bass if you turn it up all the way and you’ll probably hear it from other rooms. 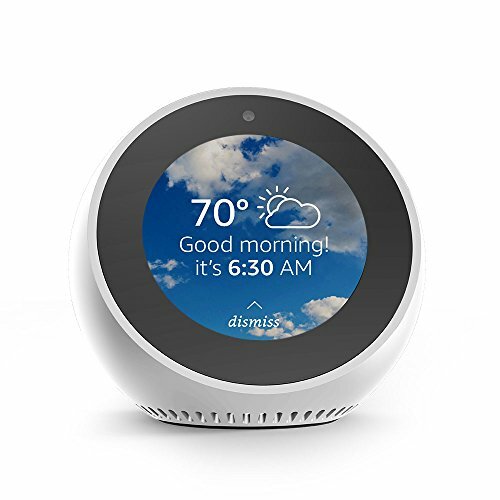 However, the Echo Spot has a smaller speaker because of its smaller stature so it won’t blow the doors off of your room if you turn it all the way up. Certainly, you can rightfully expect the Echo Show 2 to play your favorite songs with beautiful clarity – but you just won’t get the same punch with it as the Echo Show. Also due to its larger size, the Echo Show 2 has an advantage in the visuals department. The screen is rectangular, fills up almost all of the front face of the electronic, and can be seen from across most rooms. Truthfully, you could probably watch TV from wherever you want with it. However, the Echo Spot simply has a smaller screen that would strain the eyes of not watched from directly in front of it. We would be hard-pressed to want to watch TV on its small, circular screen. This point goes back to the physical size of the products, too. If you want a moveable Echo product so that you can bring Alexa around your house like a small-time traveler, the Echo Spot is probably the right idea. But you’ll find you won’t want to be moving the Echo Show 2 around too much. The Show 2 is probably best placed on a kitchen counter or tabletop where it won’t be in anyone’s way for long durations of time. That way, it becomes a dependable part of your home. These two products are definitely designed for two different ways of using them. If you plan on watching TV with your Echo product often or want your music to fill up a large space, the Echo Show 2 is the right idea. Additionally, you’ll want the show if you plan on reading books or reviewing large lists on your screen. If you just want to be able to hum along to your favorite tunes in the background of your day, the Echo Spot can do that for you. It can also be used to check the baby monitor real fast or see a few items on your shopping list quickly via its screen. But we can’t imagine that we would want to squint at the smaller sized screen for too long. Both are great as part of your smart-home automation revolution. For those who are thinking of buying the Show 2, or want to upgrade the original and wonder if it’s worth it, let’s compare the two. To start, the Show 2 has more features, such as Skype and Hulu. In the age of binge-TV it’s nice to be able to watch your favorite show while cooking or stream cartoons to keep the kids occupied while you prep dinner. And Skype makes it easier than ever to connect with family and friends in a more intimate way. The Show 2 also has a larger screen area and better design. It is sleeker than the original and the larger screen allows you to see more in a way that is clear and crisp. For these reasons alone I’d recommend the Show 2 over the original. Altogether, it’s hard to say that one of these Echo products is better than the other. What really matters is how you plan on using them. Those who want a small, light, quick option are looking for the Echo Spot. Its small screen lends itself to use for “checking” things rather than “watching” things. The Echo Show 2, though, is, by screen size, a little bit bigger than most tablets, making it a prime contender for a device that is good for “watching” things. 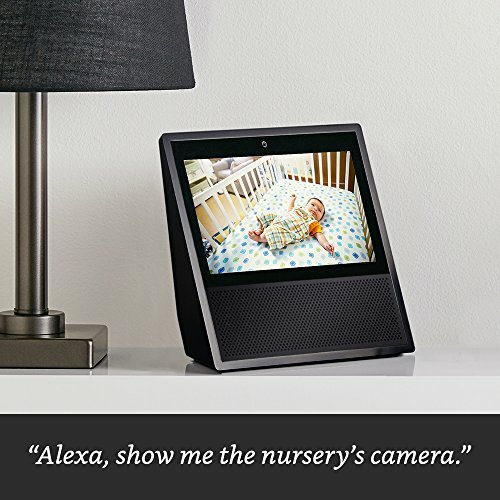 For that reason, we pick the Echo Show 2 in the Echo Spot and Echo Show 2 faceoff – but we just as easily could have chosen the Echo Spot if we wanted more agility out of our new Alexa-enabled companion.